Windows Phone 7 Marketplace: Will We Find Some Surprises At Launch? "Microsoft's Windows Phone 7 was missing a critical feature -- web video -- when we previewed it late last month, but it appears the platform may have at least a YouTube solution before all is said and done. 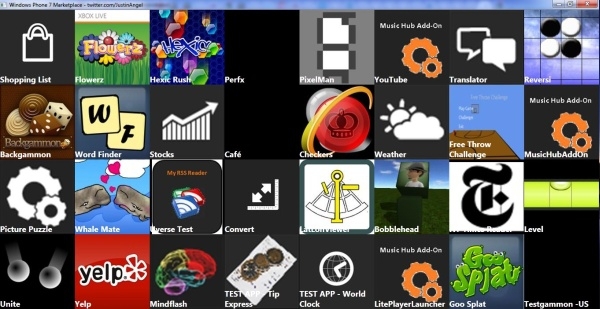 A former Microsoft program manager with access to the Windows Phone 7 Marketplace tweeted the above picture earlier this week, which shows that there are at least placeholders for a variety of games and productivity tools as well as Yelp and YouTube -- the latter of which is listed as a "Music Hub Add-On."" Sean Hollister over at Engadget posted the above image, which was tweeted from a former Microsoft Program Manager, which hints at some of what we might expect to find in the Windows Phone 7 Marketplace. There has been a lot of speculation on the topic of apps for Windows Phone 7. There is just so much we don't know yet. How many apps will we find on day 1? Will there be apps with unique functionality for the new platform, or mostly duplicates from other platforms? How will developers exploit the hub capability? What will the Marketplace experience be like? Taking a step back, what are your favorite 2-3 smartphone apps that you would love to see (or can't live without) on the Windows Phone 7 platform? For me it would have to be a decent ebook reader. my preference would be kindle with whispersync support. After these, I go for the games. "It's alright to pick your friends, but not to pieces." But more importantly will marketplace be available for most of the 3rd world countries, because if not it is of no use for me. The marketplace on windows mobile 6.5 on my HD2 does not allow software purchase for credit cards registered in Pakistan. To the last two who mentioned "Resco File Explorer", I would ordinarily agree with you as it is definitely on my list of must have applications... for Widows Mobile 6. Everything I've read seems to indicate that Microsoft has no intention of letting users view a "file system" in Windows Phone 7, so I didn't mention it in my list. How do you guys see the utility of this application without access to a file system? I think we need to keep in mind that WP7 is not simply the next version of WM6. It's a whole new beast, and based on some of the app "requirements" that people have below, some people don't seem to be realizing that. Resco File Explorer / Total Commander - as mentioned above, since apps run in a sandbox, you wouldn't be getting much value out of these applications as they are today. They'd only be able to manipulate their own files. Lookout Mobile Security - since apps can't run in the background, there seems to be less of a need for this. WP7 has built-in support for FindMyPhone (http://www.mobileburn.com/news.jsp?Id=9996), and it seems like the rest of its feature-set is just part of WP7 already as well. Pocket Mechanic / SK-Tools - these apps typically modified regkeys or did system hacks. Since apps can't access stuff outside of the sandbox unless it's exposed via the SDK, it's unlikely that there would be any type of "poweruser" app that could make system wide changes like these. I'm looking forward to a huge Marketplace with hundreds of thousands of apps. I want tons of choices, and I want to install tons of apps. Just keep in mind that WP7 is very different than WM6 both in form and function, so the "requirements" that we have based on our WM6 (and earlier) use may not really carry-over or make sense when migrating to WP7. I'm completely with you on eWallet though...I've had a version of that running in my pocket since 2002. I'm really hoping to see them come out with something for WP7. This posting is provided 'as is' with no warranties, and confers no rights. The post is my individual opinion and does not necessarily reflect the opinion of my employer.